Hunter Lewis's book Where Keynes Went Wrong was the greatest literary surprise of 2009, a welcome relief from a slew of awful books on economics appearing in the popular press. Lewis's book is thoroughly Austrian, a recapitulation of Hazlitt's argument against Keynes applied to contemporary problems. He has learned from Rothbard, Reisman, Hutt, Rueff, Mises, and Hayek. This book is accessible to anyone with a basic economic understanding. The author takes apart the parade of paradoxes that are strewn through Keynes's work. He points out that most are not paradoxes at all; they are simply untrue! One is left with a sense of astonishment that such a tissue of fallacies could have so deeply embedded itself in into the mainstream opinions of media and government and academic leaders - even public consciousness. Lewis smashes the edifice completely in this extremely well-done book. from Miami Good intentions, but terrible execution. When I purchased this book I was expecting a conclusive and thorough look at Keynes polices and writings refuting his ideas not just theoretically, but also historically. Unfortunately upon reading the first few chapters I realized that this book would not provide that. Instead the book is filled with intuitive assumptions and outrageous claims, (which curiously enough he attributes to Keynes' theories) with little to no historical evidence. The book just felt a little unorganized and lacked a strong structural premise to attack Keynes' theories. All in all I wouldn't recommend this book at all. If you really want to read a critique of Keynes' theories I would strongly recommend Henry Hazlitt's "The failure of new economics", which does provide strong and conclusive arguments that refute and discredit Keynes' polices. Either way you express it, America went wrong by adopting Keynes' economic policies, which continue to permeate our federal government today. This book makes obvious the stealth language used today by central bankers and politicians to grow government by taking control of the economy. Thank you Mr. Lewis for this inspirational resource which motivates the reader to fight against government tyranny and to reestablish a free market economy in America. You have provided so much evidence of Keynesian wrong-headedness, misinformation, and propaganda which was being created at the same time as socialist, communist and fascist philosophies were being forced upon the world's population. Keynes and his contemporaries of that period, including many American economists and politicians, as you clearly make the case, could not present a coherent argument for why a national economy needs to be interfered with by government and politicians in order for it to reach its full potential. Great book! Hunter Lewis goes back to Keynes' writing, he tells what Keynes says in Keynes' own words and then shows why he was wrong. This book is essential to understand the current economic mess. It's very easy to read. I highly recommend it. The author makes a great job of refuting Keynes and Keynesian theory. The style of writing and structure of the content is extremely good. Keynes' theories, arguments and statements are listed verbatim and then correct economic analysis is applied. 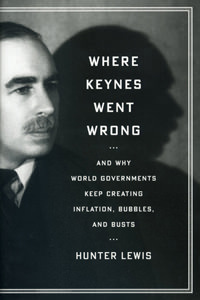 I would highly recommend this book to anybody wanting to know more about where Keynes went wrong. I just finished Mr. Lewis' book, and I must say it was a quick, easy and insightful read. A friend of mine had purchased it and enjoyed it enough to loan it to me and I shall return it with a positive "thank you". Lewis' writing style is also something to comment about. He is very concise and too the point. He devotes about a quarter of the book to talking about what Keyens actually said and wrote, and then spends half the book refuting practically everything in a respectful, factual manner. For anyone wanting to understand Keynesian economics and how to refute it, this is a necessary book to own.